Back in the days before cell phones and PhotoShop, when I was employed as an Art Department Technician at a community college and had to bring a floppy disk and borrow a colleague’s Mac Plus if I needed a computer, I met a charming retiree-student named Fran. In addition to creating beautiful sculpture in her art classes, Fran had completed a challenging culinary program. She periodically brought me treats with specific instructions that they were for me, not to share with students! Fran joined forces with Renee Shepherd from Renee’s Garden to create the cookbooks “Recipes from a Kitchen Garden” and “More Recipes from a Kitchen Garden.” These are wonderful resources for gardeners, and Renee told me recently that a third cookbook is in the works to be published late this year. She mentioned that seasonaleating.net can host a giveaway, so stay tuned! 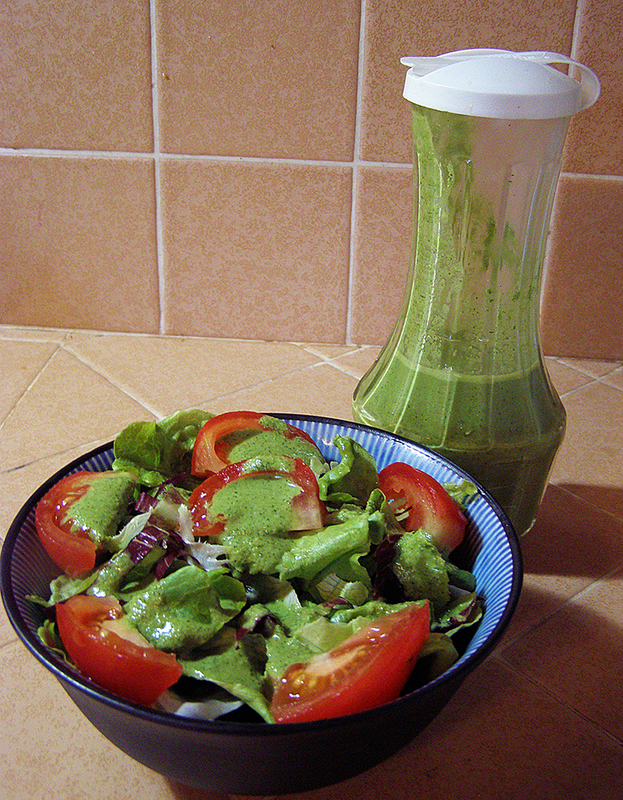 This dressing is surprisingly light, perhaps because of the lemon, which also keeps the dressing from turning brown like pesto can. 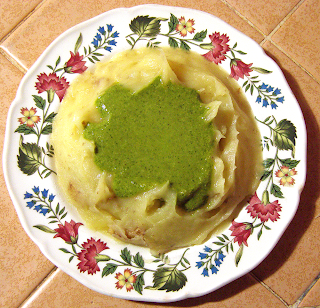 The parsley and touch of oregano, not to mention the wine and lemon zest, lend the dressing a complex flavor. I did, as usual with pesto, substitute 2 tbsp. of water for 2 tbsp. of the oil to save some calories. This might make the dressing taste a bit more lemony, but very tasty. The authors suggest pouring this over fresh toasted crusty bread or hot fluffy baked potatoes, as well as green salads or tomatoes. I misread this to say “hot fluffy mashed potatoes,” and couldn’t resist trying out that idea. Mmmmm! Combine all ingredients except salt and pepper in blender or food processor. Process mixture until thoroughly blended. Add salt and pepper to taste. Dressing will be thick. Stores well in the refrigerator to enjoy over several meals. Note: I used my immersion blender and the mixing cup that came with it, with good results. I blended all ingredients except herbs and cheese first. 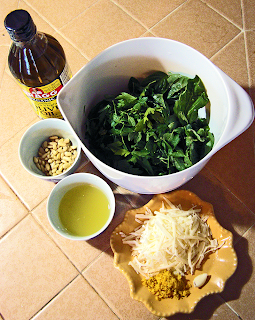 Then I blended in the herbs, and finally the cheese. Much easier to clean up than regular blender or food processor.